Sometimes, if you're unlucky, you can pull out of the borough parking garage next to the public library just in time to be trapped by a truck loading recyclables. When this happened last week, I decided to make the best of the bad luck and inquire about where the recyclables go. The driver said the foodwaste and plastics were being burned for energy, which sounded questionable, so I later called up Waste Management and eventually was able to get the low down. Waste Management picks up recyclables from Princeton's public schools and various businesses in town. Plastics 1-7, paper, etc. go to sorting plants in Philadelphia or Newark. A lot of the cardboard is then shipped overseas, probably to make new boxes for all the products headed our way. I asked if there are any particular contaminants that cause problems in the recycling stream, and was told that grease/food on the paper and plastic was not good. (That's why it's important not to recycle the grease-stained portion of pizza boxes, which can either go in the trash or get composted with your foodscraps in the backyard or as part of the township's curbside foodwaste recycling program.) Little bottle tops are not a problem. For foodwaste, which is trucked all the way to the Peninsula Compost plant in Wilmington, Delaware, glass is the main contaminant, since it can't be easily filtered out of the final product. Princeton's trash, or at least Waste Management's portion of it, heads to a landfill in Tulleytown, PA, 20 miles from us, just past Trenton. Best I can tell from google maps, the landfill has a splendid view of the Delaware River. Waste Management is proud of its closed Patterson Avenue Landfill in Hamilton Township, which is now a wildlife refuge. As for the driver's mention of using recyclables to generate energy, they have a waste-to-energy plant in south Jersey, but it's for burning trash. These photos are from a few weeks ago after a light snow. Winter's a good time to see all the dirt and oil left by cars and trucks passing by. This looks like a lot of oil, but it spreads out so thin that looks can be deceiving--a good thing because this will be swept eventually into the storm drain and into Carnegie Lake, via Harry's Brook. The sequence of oil droplets headed around the corner to the left. Snow makes visible the dark patina left by car tires, brake linings and drops of oil, all of which come under the heading of nonpoint pollution. One other benefit of hybrid cars is that their brake pads last much longer, since much of the braking power comes from sending energy back into the battery from the wheels. All of which is to say they contribute less to the nonpoint pollution accumulating on the pavement. The following was published in the Princeton Packet "As I See It" series on January 13. The column is no longer easily accessible on the Packet webpage, so I'm posting it here. An update on discussions set in motion by this column can be found here. Every now and then, forgetting all the pitfalls that await, I set out to improve recycling in Princeton. No other environmental venture involves as much patience, persistence, and willingness to wade through endless layers of complexity. For inspiration, it helps to look to nature. All of its products, when the time comes, are quickly broken down by myriad organisms into the basic ingredients for new life. The brilliance of creation is balanced by an equal brilliance of decomposition. That’s how our economy would work if it were in balance. to the top of the vat at the recycling plant. recyclables go after being picked up at the curb. sorting of paper from bottles, aluminum from plastic, and so on. least in the borough, no information has arrived in the mail for years. aerosol cans and cleaned aluminum trays and foil. list requires amending their master plan—a cumbersome process. accepted, but end up getting shipped overseas, for uses unknown. can be found at princetonprimer.org. Public Library on January 24 on recycling in schools. lack well-designed recycling containers paired with trashcans. in our homes, schools, businesses, and on downtown streets. This is the most timely time of year to trim your water consumption. According to borough staff (likely the same in the township), a residential sewer bill is calculated by 1) totaling up your January through March water consumption and multiplying by four, or 2) your total water consumption for the year, whichever is less. Since water use typically rises in the summer, e.g. for watering the yard, consumption in the first three months of the year tends to determine how much you pay. The borough will soon be separating the sewer bill from the property tax bill, but the calculation used will remain the same. Despite the antiquated rantings of humorist Dave Barry, toilets on the market today outperform the old water-guzzling varieties while using even less water than the 1.6 gallon low-flow standard. Some, like the American Standard Cadet 3, function as duel-flush even though not advertised as such, increasing efficiency even more. It's easy to research brands by reading reviews on the internet. If you have a house full of wasteful toilets but don't want to replace them all, start with the one that's most used. Since hot water takes awhile to reach the faucet, wash hands with cold water. Any hot water not hot enough to kill bacteria probably just makes them stronger. Imagine the long trip Princeton's tapwater takes from the town's water plant to your faucet, then down the drain to the wastewater treatment plant, and wonder why anyone would want to let water run unused from faucet directly into the drain. Navy showers--a niche market, but worth considering, particularly in the summer, when the last thing one wants is more heat and humidity in the house. A similar approach can be used for washing dishes. Today's post explores some factors influencing Princeton's weather. Recaps of 2011's extreme weather, in the Trenton Times and also on a CBS program called "Eye on the Storm", featured interviews with New Jersey's state climatologist, who turns out to be a Rutgers professor by the name of David Robinson. He's been state climatologist for 20 years. In the two interviews below, he describes the various influences that contributed to the extreme weather of 2011. I summarize each interview. For the past two winters, NJ weather has been influenced by a "la nina" event, which has to do with below average temperatures in the eastern tropical Pacific. Usually this means more mild winters and somewhat less snow than average, but there's another phenomenon called the North Atlantic oscillation that can trump the effect of "la nina". That's what happened last winter, when the North Atlantic oscillation "tanked", i.e. went into a negative phase that dumped snow on central and northern NJ from Christmas through Groundhog Day. Because NJ is "squeezed in" between a huge continent to the west and the ocean to the east, and is situated halfway between the tropics and the poles, extended forecasts are particularly difficult. In terms of extreme weather, 2011's 18 inch rainfall in August in NJ shattered the previous precipitation record of 12 inches in Oct, 2005. Weather records for NJ extend back to 1895. 2011 was unprecedented in a number of ways, with the wettest month ever recorded, the wettest summer on record, and a snow storm like no other ever recorded in October. One can't take any one storm or any one year and say it's due to changing climate, but we have to look at human impact on the globe. Because the globe has warmed, we have a more energized atmosphere that can hold more moisture. Not every year will be worse than the last, but we may be coming to a new normal with warmer weather over all and more flooding rains and odd extreme weather events. With snow on the ground yesterday morning, there was no time to waste. Winter's visits can be as fleeting as snow shadows cast by trees. A S.W.A.T. family--Snow Division--answered the call to stage a snowball fight on the Westminster Conservatory lawn. By afternoon, winter had largely melted away, but not before leaving behind a souvenir. Finally, some snow! There's been a real drop in light recycling this winter, compared to winters past. Which is to say that snow has been scarce, and instead of light getting bounced around on white surfaces, it's been swallowed by the drab browns and grays of a snowless landscape. As part of an energy event during the Princeton Environmental Film Festival's second weekend, volunteer Lindsey Kayman helped kids roast marshmallows using what was supposed to be a solar heater. Given the clouds, a spotlight served as surrogate for the sun. Even on cloudy days, a hand generator can get light bulbs glowing. The compact fluorescent on the right was a lot easier to light up than the incandescent. Some exercise gyms have picked up on the human generator theme and purchased exercise machines that generate electricity. These are handy devices for exploring how much various electronics use in your home. Knowledge is power, or, rather, knowledge leads to reducing the need for power. Here, the meters compare the energy drain of two different kinds of cell phone chargers. The one on the left is an older design that has a big coil in it that uses 3.4 watts of energy even when it's not recharging anything. The one on the right doesn't draw power except when it's actually being used. You can buy this sort of meter for $20 online, or hopefully the library still has some available for borrowing--a gift from the Princeton Environmental Commission. The Kill a Watt meter has limitations for measuring home energy consumption. To track electrical energy use by your A/C, furnace, oven, electric dryer, and other appliances without standard plugs, you need a whole-house energy monitor. One such device that's easy to install is produced by a local business whose website is at wattvision.com. Worth taking a look at. One stealth service provided by the Princeton regional schools is public access to the swimming pool at JW Middleschool. I went a few times with my daughter a couple years ago. Plenty of open lanes, and though the water is kept cooler than the YMCA pool, one can get used to it. Cost is $40 for ten swims. Hours are 8-9pm, M, W, Th, when school is in session. More info here. Note, Feb. 21: I went last week, and found lots of free lanes. The life guard says sometimes there are swim team practices, but at least four lanes are always available for public lap swimming. The water was comfortable. It's kept around 78-80 degrees, compared with 85 for a warmer pool. There's very little hint of chlorine, which may have to do with the cooler water and very active ventilation system. Access the pool from the Guyot St. side, next to the newer gym. Highlights this weekend at the Princeton Public Library include two films by Ian Cheney on Saturday at 4 and 7pm, and a presentation by underwater photographer Stan Waterman at 3pm on Sunday. this information to adults and students of all ages. A street drain serves much like a bus stop for trash. This is where bottles, cans and various insundries wait to catch a ride to Harry's Brook, which takes them down to the main line--better known as Carnegie Lake and the Millstone River. I'm sure service is slowed by lots of stops along the way, but eventually they get dropped off at the Atlantic Ocean, for destinations that include the Sargasso Sea. These newer grate designs prevent bottles from launching on that journey, and for better or worse also make life harder for raccoons. The state very quietly passed a law about a year ago banning televisions from the trash, in part because of all the lead and other toxics in them. One still sees TVs put out on the curb, but I've noticed the trash haulers often adhere to the law now and don't take them. There are several options for recycling televisions and other electronics. One is to drive out to one of three Mercer County recycling events this year, the first one being March 10. A friend sent me a link to Best Buy's offer to take all manner of TVs, whether you bought it there or not. That might be the easiest option, if you're out at the mall anyway. Princeton Township accepts computers at its location at Witherspoon Street and Valley Road, but by appointment only, and no televisions. 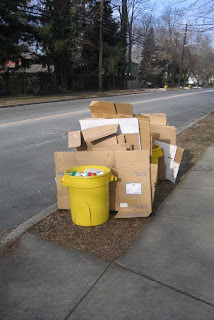 The Mercer County recycling website may be of general interest, since they handle all curbside recycling in Princeton. Note: Here's another friend's suggestion if you're headed up to Ewing. "I confirmed in Jan. 2012 that the Goodwill store in Ewing (1628 N. Olden Ave; 609-392-2865) will take all sorts of electronics for proper recycling, including CRT-based TVs and computer monitors. The Donation Center is open Mon-Sat, 9am-8pm, and on Sundays (check hours)." If you're curious about where Princeton's curbside recyclables go for separation at a Materials Recovery Facility (MRF), there are a few pictures at the Colgate Paper Stock Company's website. For a more dynamic rendering of the very impressive sorting technologies now being deployed, there are many videos on the web that give virtual tours of various recycling processes. They are likely analogous to the Colgate plant. Here's a new sorting plant built by Waste Management in Philadelphia. If you like a tour with a British accent, try this video from Northumberland, UK.